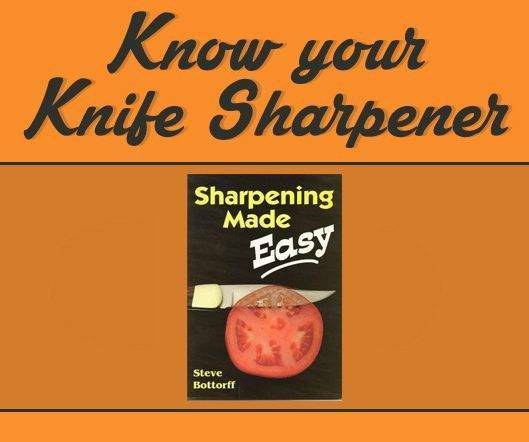 Here’s our interview with Steve Bottorff, knife sharpener and author of one of the most popular knife sharpening books ever: Sharpening Made Easy. 1. Hi Steve. Do you remember the first time you sharpened a knife? When I became a Boy Scout and got my first knife my grandfather taught me to sharpen it. He lived with us and as I recall he was almost 90 years old at the time. He was a country doctor in an era before disposable scalpels and when all doctors performed some surgery. I could not match his scalpel sharpness but it set a standard that I have pursued to this day. 2. 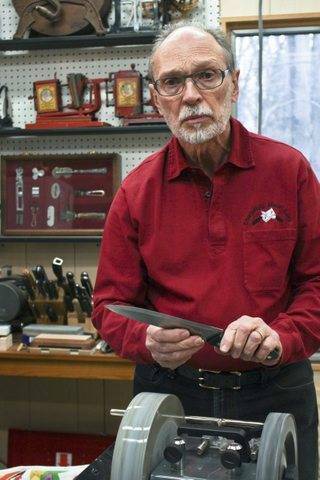 What was the main challenge when you first started sharpening knives? 3. Can you tell us more about your sharpening technique? Today I always use a Tormek wet grind for my primary bevel, slow diamond wheels for burr removal and slow ceramic wheels for the final honing. Heat is the #1 enemy of edge live so slower is better. This gives a slicing edge that meets the needs of 95% of my customers. When the customer wants a razor edge, such as on a high-end Japanese knife, I will strop the edge on the slow leather wheel of the Tormek. 4. How did your sharpening technique develop during the years? I relied on luck to get a good edge for decades. Then I began using rod-guided systems. There is no better way to learn what a proper edge looks and cuts like. Quickly I became an angle fanatic. From there I explored power systems for more speed without giving up quality. I discovered paper sharpening wheels and their fast razor sharp edges. I became a polishing fanatic. The pendulum having swung both ways I am now a moderate. The angle can be off a few degrees and still get a good edge. And if the edge is too polished it will slide when making a slicing cut because there is no “tooth“. 5. How did sharpening become a business? It began as a hobby. I am an electrical engineer and worked all my life in the test and measurement business, the last 20 years in sales and marketing. I began looking seriously at the sharpening gadgets on the market and in 1999 I wrote an article for Knife World magazine. That article became the basis for my website and I was working on expanding the content when Knife World asked if I would be interested in writing a book for them. Since I was about to retire I said yes. The book was published in 2002 and sales were great immediately. People began to phone and ask if they could study with me, so I opened a school. Then they asked where to buy the equipment I recommended, so I opened an online business. Finally the local farmers market called and asked me if I would sharpen at their market. I protested that I only did it for family and friends and was not set up for retail, but they persisted with an offer of a tent and tables, plus free rent. So I became a sharpener. Except for an occasional gig, I am retired from that now to concentrate on traveling. 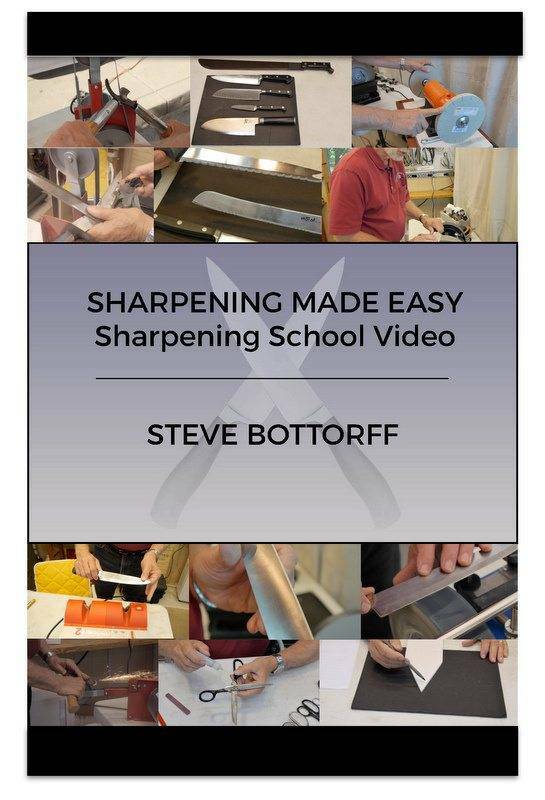 My book is still available and we have captured the sharpening school on a video so anyone can learn my methods without raveling to Ohio. 6. Is starting with cheap knives a good idea for beginners? Why? I think a sharpener should sharpen at least 100 knives before he or she goes into business, but they should not all be cheap knives. Cheap knives can mislead because they generally are thin and easy to sharpen. Get a dozen cheap ones and sharpen them 4 times each. That’s half way to your 100. Then start with home, family and friends, asking for feedback as you go. Hopefully you will encounter a chef or other serious knife user who can act as a mentor. Make sure there are a few heavy chefs and hunting knives in the mix. Don’t overlook lodge or church kitchens that would appreciate a free sharpening. 1) Not controlling your angle. Use a jig or fixture. 8. 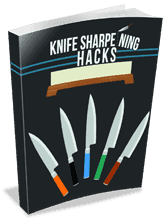 How should a beginner start sharpening knives? What do you think should be their first step? Start with a rod-guided system like the Edge Pro or other with a good guide. Avoid pull through gimmicks. And read my book. 9. Are you still perfecting and improving your sharpening technique today? Yes, I am always looking for new ideas. There is no one right way. I attend a knife show at least once a year and follow the forums. A colleague just invented a jig for faster setting of the knife jigs for the Tormek wet grinder.